It’s a long time since I last read a graphic novel, and this is probably the first ‘grown-up’ graphic novel I have read. I’m pretty sure that the last ones I read were either Tintins or Asterix stories. In the event, this only took about twenty minutes to read, so despite its more adult subject matter, it is no more challenging to read (on a technical level) than Asterix. Where it is more challenging is in the content of the story – the author’s attempts to uncover repressed memories of a massacre in a Palestinian refugee camp during the Lebanon War in 1982. It is a disturbing tale, as it emerges that the memories are repressed due to the guilt the author feels for having aided those perpetrating the massacre without entirely realising what is occurring and his role within it. As one of the cover quotes explains, the animation (the quote is referring to the film version of the story) acts as a distancing device, which makes the final pages, which contain real photographs of the victims, all the more shocking. I’m torn, because part of me regrets reading this book (perhaps not expecting something such harsh reality to leap from the pages of a graphic novel), and part of me feels that I should be reading things which challenge me and provoke a reaction, even if it is one I don’t like. I stumbled across this book quite by chance in Chelmsford Library and borrowed it to see how well Per Wahlöö could write without his partner in crime (pun definitely intended!). The answer is, pretty well! The story is a strange combination of standard detective novel crossed with a science fiction fable. It follows a Detective Jensen, a policeman in an unnamed country at an unspecified point in the future where the government has, benignly and with the best intentions (so it seems to me), created a depressingly sterile society. Out of the blue, someone sends a letter to the company which publishes 99% of the magazines read in the country, threatening to blow up their landmark office block. Jensen is given a week to solve the case but it seems as though his boss is heavily influenced by the publishing company and they would rather it were solved quickly than correctly. In some ways, despite being set in the future, the story is strangely dated, a little like watching the original Star Trek series. However, it is much better than JG Ballard’s ‘The Drowned World’, despite certain similarities in tone and setting. It was still enjoyable, and at only a shade over two hundred pages, it didn’t outstay its welcome. Ed McBain, where have you been all my life?! I picked this book up at the same time as the three library books which surround it in this diary entry for mere pence in a second-hand bookshop in Chelmsford simply because I had heard good things about Ed McBain in a review of Dennis Lehane’s latest novel. McBain’s influence on Lehane is clear – both employ a gently sarcastic tone and do a good line in everyday banter. The great joy of this novel was the unintrusive way in which the main plotline was interweaved with the everyday lives of the detectives and the believable methodology and progress of the investigation. The only annoyance I felt came with the realisation that I had started my Ed McBain experience with the very last book he ever wrote, and the 53rd of the ’87th Precinct’ series – annoying because it means I now have another 52 novels to read, and I have started at the end! 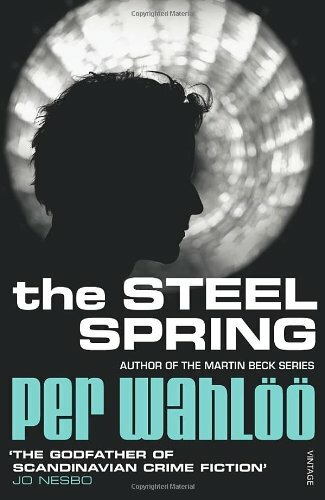 This was the second Per Wahlöö solo novel. Again, only two hundred pages long, it was a quick read and held my attention throughout a quiet Sunday. However, thoughts and feelings which had only vaguely insinuated themselves in the first book were much clearer and stronger through this one. The main character is an Inspector Jensen, a policeman in the unnamed country sometime in the future. The society is a twisted utopia, a carefully created demonstration of the path to hell being paved with good intentions. Jensen is a product of this society and is practically robotic. He is middle-aged, lives alone, has no opinions, emotions or imagination – in fact lacks any kind of human characteristics which would make the reader warm to him. This does really bring home the loneliness and sadness which Per Wahlöö clearly wishes to evoke but also makes the books a rather cold and clinical experience. I don’t normally read autobiographies. The few I have read or skimmed have fallen foul of a number of obvious pitfalls – a lack of subjectivity, shameless self-promotion, and the growing impression that famous peoples’ lives are actually just as mundane as mine. As a consequence, I approached James Ellroy’s memoir with low expectations and the hope that I wouldn’t find that a disappointing read clouded my opinion of his other work. Thankfully, I couldn’t have been more wrong. Whilst Ellroy is a pretty unabashed attention-seeker anyway, his book contains none of the vanity of others and in fact is startlingly candid about his younger days. The central theme is the murder of his mother in 1958 when he is ten years old. The crime is never solved (it remains unsolved to this day) but in the early nineties, Ellroy teams up with a retiring detective to reinvestigate his mother’s murder in the hope of finally catching her killer. To provide context, he describes his relationship with her and his father along with the impact her sudden demise had on him. What is interesting is that his blunt, staccato writing style, normally employed to give his brutal novels a very immediate impact works equally well at conveying the subtle modifications in his feelings towards his mother as the reinvestigation progresses. 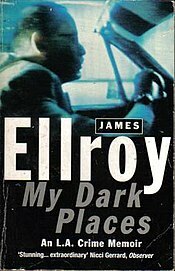 The problem with James Ellroy is that once you’ve read one of his books nobody else is quite able to match up. The next book is almost always a disappointment. Having enjoyed ‘My Dark Places’, I was particularly aware of this problem. I decided to dodge that particular bullet by reading another of his books. I found a copy of his second autobiography ‘The Hilliker Curse – My Pursuit of Women’ in Braintree Library and dived straight in. There is a certain amount of overlap between this and ‘My Dark Places’ – I decided that reading two versions of the same story back-to-back might be better than reading them a month or so apart as I could almost fool my memory into believing that they were actually two parts of the same book. Well, it kind of worked. The actual story didn’t grate in the way that two repetitive books could, but the story wasn’t really for me. Maybe it’s my stiff-upper-lip Britishness but I found reading 200 pages on the subject of James Ellroy’s love life a little awkward almost. I think that his writing style is both what redeems this book and a problem in itself. Had it been any other writer, I don’t think I would have finished the story, but equally, at times Ellroy’s love of tabloid-esque alliteration made the anecdotes seem glossy and artificial. Added to that is the tone of his recollections – at once both admirable in their lack of criticism or blame for his various partners and frustrating in its insistence that his love for these women is the result of some greater cosmic plan which manages to conform to both his religious convictions and a sort of occult belief in his own ability to “conjure” the women of his dreams – which is like listening to an unbelievable sermon from someone you are beginning to suspect is less grounded in reality than you previously thought. 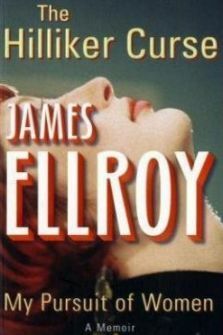 James Ellroy has always come across as someone a little outside normality, damaged by his mother’s murder and unable to totally move on, but this book absolutely confirms it. What I did find interesting was that if at any point I stopped and actually thought about the tales he was telling, I was struck by how unpleasant he was (and perhaps still is). He outs himself as one of those creepy people we have all known at one point in our lives; the ones who have rubbish social skills and go about compensating in all the wrong ways. It is a great credit to his skill as a writer that even after considering these monumental personality flaws, I felt sympathy for him and still respect him. On the bright side, it has broken the Ellroy Curse on the next book. This entry was posted in Book Diary, Books and tagged Ari Folman and David Polonsky, Book Diary, Book Diary 2012, Ed McBain, Graphic novel, Per Wahlöö by Philip. Bookmark the permalink. I’ve not read or seen Waltzing with Bashir, but if you want to try the gold standard of that kind of genre, try Maus by Art Spiegelman. It is a graphic novel of the artist asking his Jewish father about his life pre-Nazi occupation, during, and after. The ‘gimmick’ that works incredibly well is that each nationality/race is depicted by a different animal (Jews are mice, Germans are cats, Poles are pigs, French are frogs etc), and is told from the perspective of one man living through it. It doesn’t glamourise the protagonist, who has a controlling and infuriating relationship with people around him, but the journey he takes is important to gain an understanding of the time and situation. It won the Pulitzer Prize and is considered to be one of the best graphic novels published. As you might expect though, it is challenging and will provoke reactions. Not much to say on the other books, not being a reader of Scandinavian crime thrillers, nor autobiographies.